Bangkok throws up a heady hodgepodge of adjectives: it’s amazing, bizarre, wonderful and impressive all at once. The entire city is awash with life, day and night, in a way that few others are. While the legendary sights, sounds and smells of this energetic metropolis are formidable reasons to visit, sometimes you need a break from it all – and what better way to transcend the hustle and bustle of Bangkok’s streets than to visit to one of the city’s many skyward watering holes? If you’re looking to rest your travel-weathered feet and indulge in some well-earned R&R, these 10 rooftop bars quite literally rise above the rest. 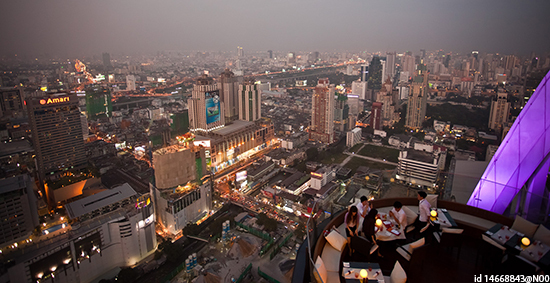 In the hierarchy of Bangkokian nightlife, Sky Bar is royalty. Long regarded as one of the city’s premier nightlife spots, Sky Bar’s reputation is only outdone by its commanding views of the city which are hard to beat while sitting atop of the 63rd floor of one of Bangkok’s most famous hotels, serenaded by the jazz bands that play there nightly. Fittingly named after the sensation that’s likely to wash over you as you peer over the edge of this 61st-floor, open-air lounge, Vertigo is the place to be if you’re in the mood for a chic, wind-swept locale that offers great views of the city and an upbeat atmosphere. 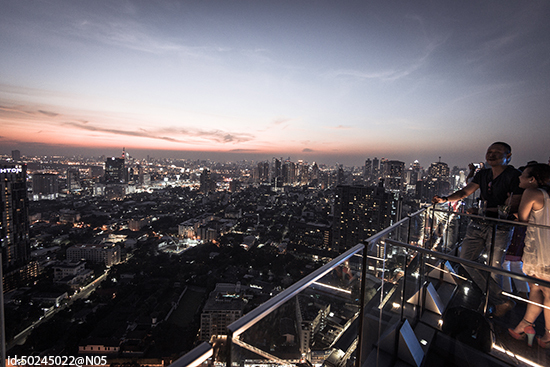 Octave is a rising star in the ever-growing list of Bangkok rooftop locales. Conveniently situated in one of the Thai capital’s most upscale residential neighborhoods, Thonglor District, Octave is a popular destination for well-heeled locals and tourists alike who come for the attractively-priced drinks, ambiance and panoramic views. The sundowner specials between 5 and 8pm make Octave an appealing option for early-evening cocktails. Another new addition, Above Eleven’s proximity to the infamous nightlife of Sukhumvit’s Soi 11 makes it an ideal spot for those looking for a classy warm-up to a lively night out. Giant tree-shaped lamps and fake grass, juxtaposed with an urban background, create a surreal atmosphere that’s well-suited for taking in the views of Bangkok with a refreshing cocktail in hand. A bit further afield, Blue Sky offers rare panoramic views of northern Bangkok as well as boasting a low-key but luxurious atmosphere. 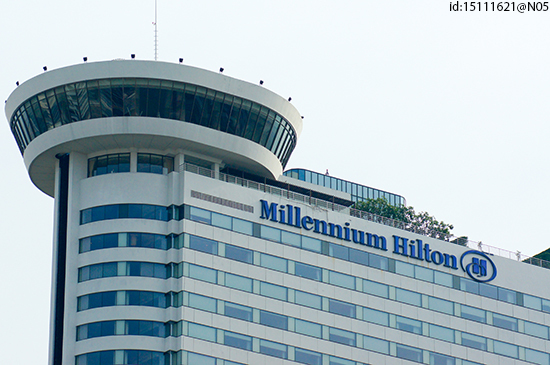 Its prices are surprisingly reasonable too, especially given that it’s atop one of Bangkok’s most decadent hotels. Easily one of the most impressive places on this list, Red Sky’s unique design of layered concentric circles resemble an open lotus flower, making for a truly striking piece of architecture. This, coupled with 360-degree views from the 55th floor and stylish drinks, make Red Sky the place to be if you want to impress a date or splurge on a high-end evening, in more ways than one. Right in the heart of Silom District, Cloud 47 is an understated and underappreciated rooftop gem which offers surprisingly low prices, uninterrupted views of the city and a wide-open atmosphere. There’s even a modest beer garden for people who simply want to hang out and enjoy the scenery, as well as a posh wine zone for a more cultured experience. This rooftop bar isn’t quite as high-reaching as its neighbours but it still feels like a private enclave. The Nest opts for warm lights and a cosy atmosphere instead of neon lights and a flashy vibe. The end result is a lounge where you’re much more likely to feel relaxed – perfect if you’re looking for a casual, reasonably-priced place to start your evening. High above Khlong San, the ThreeSixty Lounge offers magnificent, picturesque views of the Chao Phraya River, Wat Arun and the Grand Palace while providing a comfortable yet luxurious atmosphere. It’s the perfect place to sit back, relax and take in scenery with a cold one or two. Perhaps the most unique of Bangkok’s rooftop options is Long Table Bar, home to what is supposedly the world’s longest table at 25 metres. The massive bench encourages people who are drinking and dining with each other to mingle. It may not be outdoors, but the communal atmosphere makes up for it – not to mention the fact it’s set against the spectacular backdrop of Bangkok. 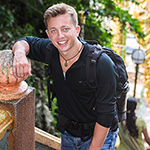 Alexander Stephan is a travel photographer and writer with Buffalo Tours. His adventures through photography have taken him all over the world – but he’s particularly enamoured with the sights, sounds and tastes of Southeast Asia. See some of his adventures and his destination photography at www.AlexanderStephan.com.